Lobsters at the 2014 Hairy Gorilla Half and Squirrelly Six. 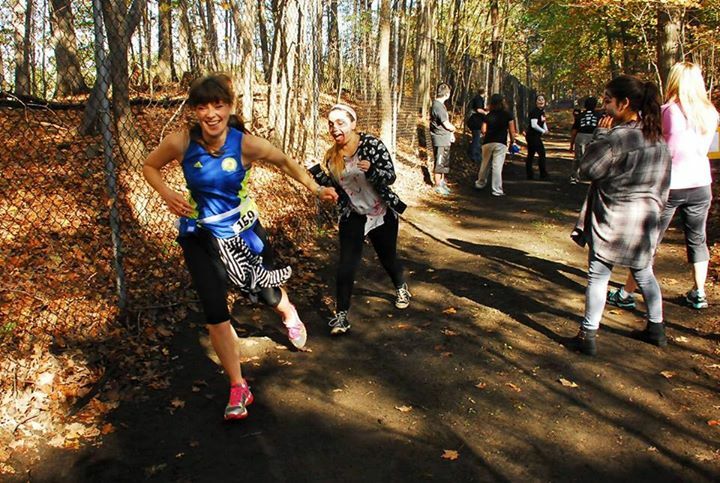 Runners and zombies at the 2014 RunDead in Saratoga. It’s the first day of fall as I write this yet it feels like a beautiful summer day. The crisp days of fall are not too far in the distance. You’ve logged the miles, taken your training seriously and you’re seeing the hard work pay off. Now have some fun with the fitness you’ve acquired and register for a costumed, Halloween-themed race, followed by a few fall classics to cap off the season. Halloween Races – First on the calendar is the 15th annual Great Pumpkin Challenge 5K/10K to benefit Saratoga Bridges. The races take place on Saturday, Oct. 17 at the Saratoga Spa State Park in Saratoga Springs at the Columbia Pavilion. Costumes are welcome and encouraged! The day also includes a kids’ fun run for children 12 and under. It’s a great community event with 2,000 runners, walkers and riders participating. The 5K run/walk and 10K run start together at 9:30am. There will be refreshments following the race and a raffle for all registered participants. Plus, long-sleeve moisture wicking shirts and raffle tickets to all who register by Oct. 14. Go to saratogabridges.org. Another costume run on Oct. 17, is the second Running SCCCared 5K Fright Run/Walk at The Crossings in Colonie. The fright run benefits St. Catherine’s Center for Children and includes a 1M walk. See September 2015 issue for the full preview. Visit st-cath.org. Next, the Hairy Gorilla Half Marathon and Squirrelly Six Miler is on Sunday, Oct. 25 at Thacher State Park in Voorheesville. Created in 2005, the HGH and SS feature giant gorillas and squirrels chasing after you, cardboard graveyards that might have your name, a chainsaw-wielding maniac in the midst, and plenty of other unique encounters. Runner’s World magazine dubbed it the “Best Costume Trail Race in America.” Sections of the course are decorated in the spirit of Halloween. Participants are encouraged to wear costumes or silly outfits to get into the spirit. The post-race party includes a pumpkin carving contest, potluck picnic and barbeque. Both distances are trail races held nearly 1,000 feet above Albany on the Helderberg Escarpment at the state park. Parts of the course can be wet and some trail sections have rocks, roots and other obstacles. The views are breathtaking and the course offers a variety of terrain. Go to hairygorillahalf.com. Also on Oct. 25, the RunDead 5K trail race will start at the Saratoga Spa State Park, where runners try to escape from hungry zombies. Here’s how it works: Each runner starts off with a flag belt and three flags. Zombies throughout the course will be attempting to take these one at a time. If you lose all three, you’re dead and the zombies have won. Individuals who raise $100 or more for Special Olympics will receive two additional flags as lifelines for the race. The lifelines increase your chance at survival and your opportunity to win some prizes. The individual who raises the most money as a runner, will receive an “invincibility vaccination” for the first three zones of the race. The zombies won’t be able to affect you or take your lifelines until you reach the fourth zone, when the vaccination wears off. Then the zombies will be able to take your flags. Use speed and strategy to keep your flags. If you finish the race with at least one, you’ve survived. If zombies have taken all your flags you can complete the race but you won’t be eligible for awards. If running the race is not your thing, sign up to be a zombie! Each zombie will be transformed in the “Mob Tent” in the morning. This year zombies will be walking or crawling for a more authentic zombie experience. Visit therundead.org. On Halloween Day, Saturday, Oct. 31, the Monster Dash 5K, 3K Walk and Kids Run will be at the Troy Family YMCA along with their Fall Festival Day. Runners and families are encouraged to enjoy the fall foliage while running the 5K in costume. The first 125 registrants will receive a sport tech competitor shirt. All kids get a free T-shirt. After running or walking, participants can also enjoy fall arts/crafts, bounce house and face painting. Post-race also includes healthy snacks and prizes and awards. The Monster Dash is part of the Capital District YMCA Healthy Community Series. Go to cdymca.org/monster-madness-dash. Veterans Races – On a more serious note, there are two local races to benefit the veterans in our communities. The first race is the fourth annual Saratoga County Revolutionary Run for Veterans 5K on Saturday, Nov. 7. This is a run through the historic town of Saratoga and village of Schuylerville to benefit the Saratoga County Veterans Trust and Agency Fund. The run starts at Fort Hardy Park, down the historic Towpath, past Schuyler House, through the village of Victory, past the Saratoga Monument, and returns to Fort Hardy Park. According to reviews, it’s a challenging course but very doable. T-shirts will be given to all registrants and a kids’ fun run will follow. Post-race includes music and food at the park. Visit finishright.com. On Veterans Day, Wednesday, Nov. 11, the Shen Runners Booster Club will host the eighth annual Shenendehowa Veterans Day Dash 5K Run/Walk, starting and finishing at the high school track in Clifton Park. The flat, fast course through the school campus will be closed to traffic and safe for all ages of runners and walkers. The event is a fundraiser for the Shen’s cross country and track teams, and partial proceeds to go STRIDE Adaptive Sports. Veterans can run free with a mail-in registration. T-shirts will be given to the first 350 runners and walkers. Check out shenrunners.com. 2014 Stockade-athon 15K racers on the new course. Stockade-athon – Sunday, Nov. 8, is the 40th anniversary of the MVP Health Care Stockade-athon 15K, a classic loop course of Schenectady’s historic neighborhoods and parks – the oldest major 15K road race in the USA. More than 1,800 runners are expected, and the race traditionally draws an incredibly deep field of open and masters runners and teams. For the second year, with strong support and enthusiastic approval from runners, the race will use the same downtown certified course as last year, starting at 8:30am from Veterans Park on State Street and finishing near City Hall. To help celebrate the 40th anniversary, Frank Shorter, will be in attendance for the race weekend and is planning to run the race. He is a four-time national cross country champion (’70-’73), winner of the Olympic marathon gold medal (Germany, ’72), Olympic marathon silver medal (Montreal, ’76), and holds many more accolades. Last chance, walk-up registration will be held at the Schenectady YMCA on Friday, Nov. 6 from 4-7pm. Fleet Feet Albany will host early packet pickup on Saturday, Nov. 7 from 9:30am-4pm. The Schenectady YMCA offer race morning packet pickup and new baggage check from 7am-8pm. For security reasons runners will not be allowed to leave bags at the start/finish area unattended, and they should take advantage of the clear backpacks provided by MVP Heath Care at packet pickup to store warm clothing, and to check a bag prior to the start. The post-race refreshments and awards ceremony will be held indoors within Proctors venues. Proctors Key Hall will be the location for refreshments, and just across the arcade hallway, runners will have access to an indoor farmers market, and the adjoining GE Theater for the awards ceremony. There will be USA Track & Field competition for open, masters, age-groups and teams, with $6,000 in awards by Fleet Feet Sports/Brooks, $1,500 in team prizes, and handcrafted pottery awards. The new MVP Health Care Children’s Run will be held on a new one-mile flat, fast course, which is out and back on North Jay Street, starting at the City Hall steps at 11am. For younger children who wish to be accompanied by an adult, there will be a 1K turnaround point to run the shorter course. This non-competitive run is for children 12 and under, in partnership with the Schenectady YMCA. Entry is free for all children but they must register prior to race day, either online or in-person. All children will receive a finish medal and goodie bag when they finish. Visit stockadeathon.com. See you out there!